From the Fair Oaks area in Pasadena through San Marino all the way to Santa Anita Avenue in Arcadia could once be referred to as an “artesian belt”. Rainwater from the San Gabriel foothills sank into the vast basin under Pasadena and percolated upward when encountering the geological formation at its Southern end, called the Raymond Dike. The above-ground part of the dike appears as a bluff cut through with canyons. The cienegas and springs that “broke forth” from the canyons of this Dike, were among the first “developed” as water sources in Southern California, and among the most historically influential. Irrigation maps from the late 1880s show marshy areas near the head of many of these streams. One especially detailed map of what is now the Huntington Library, Art Collections, and Botanical Gardens, records minor washes and springs not indicated on the 1880s map, along with associated areas of peat. This suggests the possibility that numerous smaller seeps may have existed elsewhere throughout this belt. About two centuries ago, the Padres directed two zanjas to be built to intercept waters from the whole range of hills from Los Robles Canyon in Pasadena to present day El Campo Drive in San Marino to supply the Mission. The dependable supply of water from these canyons allowed San Gabriel Mission to become so prosperous that it supplied food and other items to settlements and missions throughout California. As the pace of development in the valley picked up, boring wells and tunnels into the canyons increased the productivity of the original cienegas and springs. To this day, culverts and tree canopy in aerial views of Alhambra mark where the streams of the San Gabriel artesian belt once converged. This posting, in two parts, describes just some of these water sources from West to East. From 1816-1823 the Old Mill harnessed water from the adjacent canyon to grind wheat and corn to feed more than a thousand Mission Indians. After being put to use at the mill, the water flowed into a bog at the present day location of Lacy Park. There, the Padres built a dam to power a sawmill, wool-washing works, and a tannery. According to Hiram Reid’s History of Pasadena, the dam caused the lake to double in size. Its storage capacity increased exponentially. Though the Old Mill was quickly superseded by a more advanced mill built closer to the Mission, the canyon waters still flowed. By the 1880s, eight tunnels drilled to maximize the original spring’s output were supplying the reservoirs of the Alhambra Addition. The total capacity of reservoirs supplied by the canyon’s flow was 6.5 million gallons in 1888. Wilson Canyon was the largest of the canyons, and was a favorite picnic spot for Pasadenans and San Gabrielenos at the end of the last century. [I]n summer it seems like passing into another clime to drive from the warm sunshine into the delightsome cool green shade of the massive live-oaks, gnarled and twisted into many fantastic shapes. By 1886 at least 9 wells had been sunk in the Canyon. Hiram Reid wrote that tree rats inhabited the oaks, and frogs from the canyon were harvested for dissection by Throop Polytechnic. I live right on top of the “Artesian Belt” and you can see it working right now. Right in the middle of my street, after a good rain, you can see water bubbling up through the asphalt. The rising water destroys the asphalt leaving pockets in the pavement. The poor city public works staff come out once or twice a year to patch it up but it only lasts a while. There are several spots like this in the streets around the San Gabriel Country Club. The water usually flows for two or three days after a storm, obviously depending on how much it has rained. I know that must be an incredible pain, yet I find it so exciting when our region’s waters poke up to remind us of their existence. If only our region planned/zoned in accordance with the natural processes -especially where our water table is, where the water best percolates, natural floodplains etc. Oh well, here’s to hindsight. I look forward to Jane’s Part 2 of this series! Having grown up on El Campo Dr., I have always been aware of La Presa, the original Mission dam, now housed behind Sunnyslope Water Company’s fences. You can still stand on the dam and see it at La Presa Dr. and Huntington Dr. near Eaton Wash. Thanks for sharing this special history of the San Gabriel Valley. I am excited to see the rest…. I was just up on El Campo this morning and saw the same dam that Jeff was talking about. It was built in 1820 by Joseph “Jose El Ingles” Chapman. It is kind of hard to see but there is a stone with a plaque on it on the street. The overflow still feeds a zanja of some sort that goes under Huntington Drive and pops out on the other side along the west side of La Presa. It eventually feeds into a small lake / catch basin between Huntington and Duarte Road. Thanks everyone for these comments. The next installment will work Eastward across the SG Artesian belt from the Huntington Library to La Presa Dam. The Dam and Sunnyslope have been written about extensively elsewhere, so I probably will keep my mention of that location brief. David, what you shared about the water bubbling up is fascinating. Though the ranchers worked with drainage patterns, such as by using former swamps as reservoirs; when the land was subdivided, suddenly those considerations were erased. It does seem that in the areas I researched (SG and NELA), golf courses, public parks, auto courts, and public schools tend to be associated with historic wetlands…. In Ballona mapping I’ve also noted that tendency for cemeteries, schools, parks etc to be on land where streams or marshy areas would have dominated, leaving the drier land for private development. Also, I found newer era subdivisions on the old cienegas, they must have had to wait for the land to drain sufficiently or the technology to make it developable. However, these old marshlands – wastes, as they were often called – in some areas were put to primarily industrial use, as we see down on Compton Creek, Dominguez Slough (Carson, Torrance, Gardena), and Wilmington areas. Where the Watson Lakes once stood today you find big industrial storage tanks. I suppose the fact that the city has not paved the street in 30 years is a factor. The bubbling is easy to miss, most of the time it is just too dry of course and when it is actually raining it is lost in the overall flow of rainwater. To see it, you have to wait until the rain has stopped and most of the asphalt has dried a bit, the contrast is clearer then. In the right light and at the right angle, you can actually see the water coming up. It is no geyser or anything like that there is a definite stream of water coming out of the ground. It is actually more well defined after the city has filled it in a bit as it seems to force the water to come up through a narrower channel. Otherwise it just looks like a pothole or a pot hole with rain water in it. I finally stopped to look at La Presa dam through the fence yesterday, and now I want to learn more about it. Could you direct me to the page where it was covered extensively? And does Sunnyslope Water Company ever have an open day so we can get closer to the dam? The “Raymond Dike”, by the way, is the scarp of the Raymond Fault, which was the source of the 1988 Pasadena earthquake. There’s some history of the La Presa Dam in Gene Dryden’s “Early Waterways in the San Gabriel Valley” in the Spring 2008 issue [PDF] of the San Marino Historical Society’s newsletter, The Grapevine. The second half of this article will be posted hopefully within a week. Here is a good resource about Sunny Slope. Ranches to residences : the story of Sunny Slope Water Company, 1895-1995 / by William A. Myers. Pasadena, Calif. : Sunny Slope Water Co., 1994. 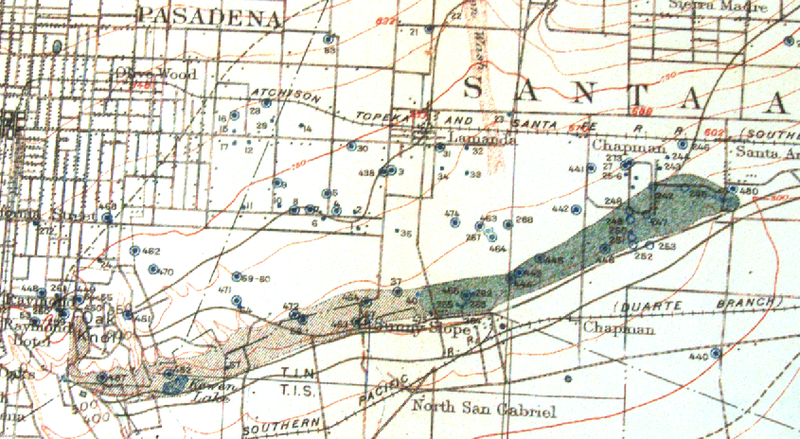 My family grew up in the Garvanza area of Highland Park and old Sanford Fire Insurance maps show a stream/river roughly where Figueroa and York come together..
Yep, sounds like the North Branch, aka Arroyo del Cal. Joe, this is fascinating. Can you tell us more specifically which side of Figueroa this was on and which set of Sanborn maps you saw it on? I was unable to find the stream on the 1920s Sanborn. Depending on the exact location, this could very well have been the North Branch which Jessica mentions, which winds along the base of Mount Washington before reaching the Arroyo Seco; or an unnamed gully/wash which took a more direct route into the Arroyo Seco. Excuse me for not posting this in the right place, but I grew up playing in the cemented Arroyo Seco (?) that runs from the Arroyo Seco Stables all the way to the L.A. River. My older cousins used to crawl in the flood control tubes near Ave 63 and Ruby street and crawl until they came out in that channel. Amazingly dangerous, I know! In the 1970’s, my junior hs friends and I heard that one of the larger drainage tunnels lead to a waterfall. We went about 200 yards into the hole before we chickened out and retreated. Any interest out there in exploring those tunnels that are near the stables under the Marmion Way Pasadena Freeway overpass? this is a great site and thank you all for posting information! Does anyone know if there were any streams, or interesting water stories, about waterways between the Rubio Wash and Eaton Wash near San Gabriel Boulevard? Hi Katie, have you looked at the San Gabriel Historical Ecology Study? It’s downloadable at Southern California Coastal Waters Research Project. I’ll take a look at my maps and post separately if I see anything else. Does anyone have current contact info for him? Thanks. You are currently reading An Artesian Belt in San Gabriel: Part I at L.A. Creek Freak.